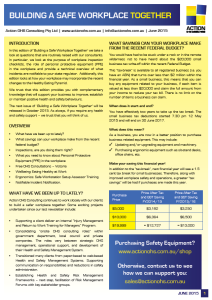 Please find Action OHS Consulting’s June 2015 edition of our 4-monthly newsletter Building a Safe Workplace Together. In this edition we take a look what makes workplace inspections effective and look at the responsibilities of both the workplace and workers regarding personal protective equipment (PPE). In addition, we provide a short overview of what incidents are notifiable to your state regulator and incorporate advice regarding changes to the Healthy Eating Pyramid.